Home Aquino Mamasapano News Ombudsman People PNOY President President Benigno "Noynoy" Aquino III SAF 44 Sandiganbayan Trending Former President Benigno Aquino III charges graft and usurpation of authority. Former President Benigno Aquino III charges graft and usurpation of authority. Former President Aquino to face trial for Mamasapano tragedy. Ombudsman affirms charges against Aquino for Mamasapano tragedy. Ombudsman Conchita Carpio Morales has affirmed the finding of probable cause to charge former President Benigno Simeon Aquino III before the Sandiganbayan for the botched 2015 Mamasapano operation. Aquino will face trial for one count of violation of Section 3(a) of the Anti-Graft and Corrupt Practices Act (Republic Act No. 3019) and one count of Usurpation of Official Functions (Article 177 of the Revised Penal Code). The anti-graft court Sandiganbayan found probable cause to put former President Benigno "Noynoy" Aquino III on trial shortly after he posted bail on Friday, November 10, for charges over the Mamasapano operations. Before noon on 10 November 2017, the charges of graft and usurpation of authority against Aquino were raffled off to the 3rd division, chaired by Presiding Justice Amparo Cabotaje-Tang, his appointee. Noynoy Aquino posts P40,000.00 bail in graft, usurption case. Former President Benigno Aquino III on Friday, 10 November 2017, posted a P40,000 bail before the Sandiganbayan to secure his provisional liberty while the charges over his alleged role in the ill-fated encounter in Mamasapano, Maguindanao, in 2015 is ongoing. 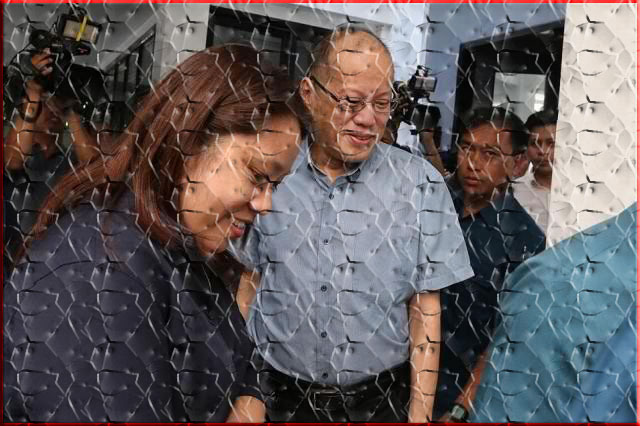 Aquino was joined by his sisters Ballsy Aquino-Cruz, Pinky Aquino-Abellada, and Viel Aquino-Dy, as well as by his legal counsel, when he arrived at the Sandiganbayan Third Division's Office of the Clerk of Court before 4 p.m.
Pulma said that the division's justices have signed an arrest warrant, but it was no longer issued since Aquino already posted bail around 4 p.m.
Sandiganbayan issued a hold departure order against Aquino.